The present church trend that tends to leave the Bible and embrace postmodernism will be the destruction of Christianity as we once knew it. 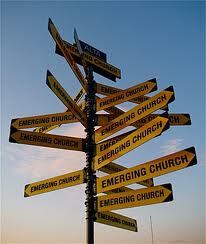 The emerging church is just another road to Rome. The Bible states that we should come out of the harlot, not embrace the harlot. It's Sunday morning at the Jammin Java cafe in Vienna, Virginia. A group of people have gathered in the back - to pray. The sticky floors and low lighting are not exactly inspirational. But this is no ordinary church. It's a new kind of worship that has sprung out of Evangelical Christianity and is being called the Emerging Church. Only a generation ago, Evangelical Protestants were flocking to so-called megachurches with congregations that numbered in the thousands. The worshippers were fundamentalists, including Evangelicals, who view the Christian Bible as the literal truth. The churches were often led by a charismatic pastor who gave fiery sermons against abortion or homosexuality. Now, a new generation of Evangelical and other Christians is seeking a more personal experience with a different political tone. They are meeting in more intimate settings, like the corner cafe, and no one is told what to believe. Stavlund says it's okay to question anything - even the most basic tenets of Christian belief. "To me it feels like an honesty, when we have doubts to say we've got doubts, when we've got faith to say we've got faith, but in all of it to be able to be accepting of everybody else," he says. Many Common Table members are just starting families and searching for a way to practice their faith differently from how their parents did. Still, the Emerging Church movement is treading on ground that traditionalists call unorthodox, if not heretical. Rob Bell, an Emerging pastor from Michigan, has drawn criticism over his new book. It argues that people of all faiths can go to heaven - something many Americans believe but Evangelical theology rejects. But young Americans are increasingly shunning them. One study found that adults aged 18 to 29 who say they don't identify with any denomination have more than doubled in the last two decades. "Just as the Megachurch as we know it today recreated what it meant to belong to a church and gave people a sense of community in a period where other civic institutions were failing, there's going to be some style of religion - maybe it's this Emerging Church, maybe it's some other movement - that will reach these young people."